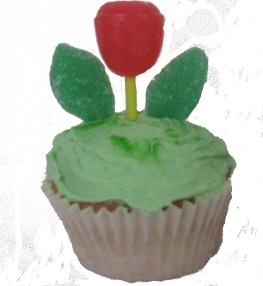 Magic Garden Cupcakes are easy to make and they look so cute! They are ideal birthday party cupcakes for any young lady! This is one of those birthday cupcake ideas that are so quick to make but you smile the whole time you are making them because they look so good, so quickly. If you don't have time to make your own vanilla cupcakes, you can easily purchase some and just do the frosting and decorating yourself. There are many different lollipops available that resemble tulips and other flowers that you just can't go wrong with these decorations. When the cakes are cold, frost with buttercream frosting. Sprinkle frosting with green sugar crystals (to resemble grass). Poke the lollipop into the center of the cake. Spear the leaves with the toothpicks and place in the cupcakes.